A. The Limestone Township Library is dedicated to providing the best possible library service to the community it serves. B. An Organizational Chart is below. C. The total amount of our operating budget for FY 2013/2014 is: $245,648.39. Funding sources are property and personal property replacement taxes, state and federal grants, fines, charges, and donations. D. The office is located at this address: 2401 West Tower Road, Kankakee, IL 60901. F. The following organization exercises control over our policies and procedures: Limestone Township Library Board of Trustees, which meets monthly on the 3rd Thursday of each month at 7:00 p.m. in the meeting room. G. We are required to report and be answerable for our operations to the Illinois State Library, Springfield, Illinois. Its members are: State Librarian, Jesse White (Secretary of State); Director of State Library, Anne Craig; and various other staff. A. Use Request Form below. B. Your request should be directed to the following individual: officer: Lynne Noffke, FOIA Officer, or Gary Dahn, FOIA Officer. I. 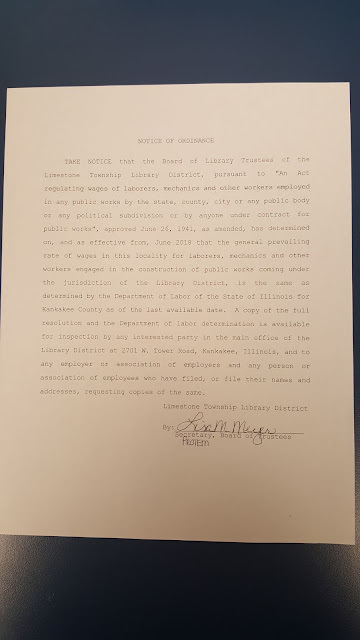 You may appeal the decision of the FOIA officer to the Board of Library Trustees.